The Black Sparrow-hawk is a medium sized bird which is extremely rapacious in nature and is popularly used in falconry for this reason. The bird in the picture is in juvenile plumage whereas an adult is pied, black and white. 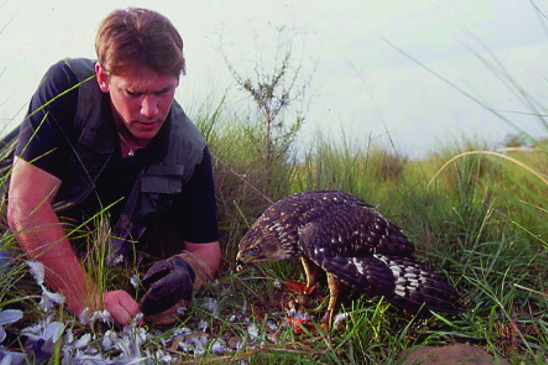 Black sparrowhawks hunt mainly birds up to the size of guineafowl and sometimes small mammals. They are an unobtrusive species that tends to hunt from cover flying in a swift dash close to the ground after quarry. They will build their nest in tall trees and especially favour exotic eucalypts. Their nests are lines with greenery to cushion the three eggs. At the end of the 55day nestling period the big chicks can become quite noisy as they solicit food from their parents. The Black Sparrowhawks at the Sanctuary are nervous birds and are in breeding pens off display.